Bufflehead is a 32’ wooden gaff sloop, strong, safe, swift, and seaworthy. (32' LOD 10'6" Beam 5'3" Draft) Her comfortable cockpit is complimented by wide side decks and a small cabin which features a very cozy, comfortable interior, including a separate head (toilet) as well as a small wood cookstove in her galley (kitchen). She has been featured in several articles and was Miss June 2011 in the Calendar of Wooden Boats. She was designed and built in 1966 by the famed Bud Macintosh for his own use, and combines all he had learnt into an expression of manifest excellence. He literally wrote ​the book on building wooden boats. Shaped full above the waterline, and hollow below, she is swift, safe and easily driven. Pine planking from a tree which grew in a cemetery and was struck by lightning is riveted with copper to steamed oak framing. She has full six foot headroom below, along with cozy berths, a small wood cookstove, a propane cooktop, a refrigerator, a sink, a table and a small private head (bathroom). Foggy days can have a serene glow to them that you just don't get on bright, clear days. If it rains though, the romance is gone. ​On rainy days, check our Rainy Day list of things to do so you'll still have a great day. Nestled among the Rockland Windjammers, she fits right in with the vintage, wooden schooners that tie up there. Sweet as the scenery, she's a graceful sight even just bobbing at anchor among the islands. Just something about those lines that soothes the soul to see. A two cylinder 13 hp Volvo-Penta Diesel is tucked in her, and its slow turning peaceful quiet power serves as reliable propulsion if the wind dies, or schedules must be maintained. ​With her club foot jib, and high peaked mainsail, she is as easy a boat to sail as could be asked, predictable and sweet, she turns heads and steals hearts where ever she goes. Come join us on the water! I started Bufflehead Sailing Charters, LLC in 2011, offering a unique way to see the Maine Coast, which has proven to be much appreciated. Eager to share tales and history of this region as well as the natural wonders and delightful experience, I invite you aboard Bufflehead. 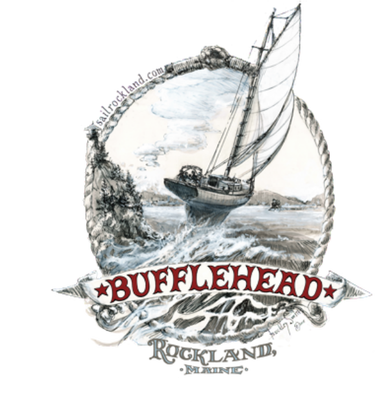 “Bufflehead really represents the spirit of sailing in the midcoast. Above is a short movie a fellow made about me and Bufflehead a few years ago. It's a great introduction to watch before coming out for a sail. How did we get such a cool logo? Seen locally and known internationally, the artist is one of a kind, and so is our logo. Click the logo, it's magic. The story of how I came to own and sail the mighty Bufflehead. 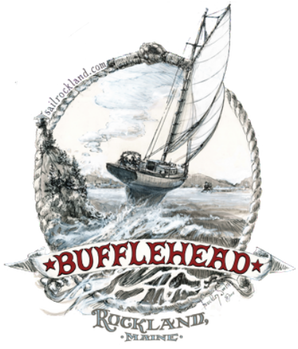 Featured in the Bangor Daily News, it's an interesting story of how Bufflehead was saved and how our charter business was launched. I began sailing, building boats and juggling at 11 years old. 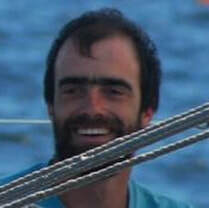 At 16, I set to a life at sea, sailing square riggers and schooners in the Pacific and Atlantic Oceans, eventually spending six years sailing singlehanded between Maine, the Caribbean and Ireland in a small engineless boat. I gave a presentation at a Pecha Kucha about my life at sea, here's a link to the 6 minute presentation, filmed Feb 27, 2015. What's a Pecha Kucha? I have logged 110,000 nm at sea, and know Penobscot Bay to be one of the finest sailing grounds in the world. I rebuilt Bufflehead in 2008. My daughter, Raya, has been working on the boat since she was 3. She will turn eleven this summer, and is often on the boat Wed-Sat. Yes, she is the coolest person in the world, I'm pretty convinced. A writer, scientist, dancer and sailor she's helping train her brother. Silas had his first trips as crew in 2018, he can steer and is starting to literally learn the ropes. Silas will be sailing with me more this summer. Hopefully learning and sharing the history of the area! He's pretty fun. Raya, occasional crew, Official 1st Mate, and Captain-in-training for our 2027 season; seen here at the launch of her first boat, that we built, the 8'4" dory Sparkle Rose, April 2012. She was 3 at the time. Maine has more than 3,000 miles of shoreline, and a thousand islands. We play the tide and the breeze to share the best of the coast of Maine on our agile, safe, cozy boat with an intimate closeness to the water and the wind. ​​Maine coast sailing! You can't see the coast from the road! ​We sail out by Rockland's own Breakwater Lighthouse and Owl's Head Lighthouse, which enclose a huge protected working harbor and bay, offering views of the Camden Hills, Owl's Head Beaches, Schooners and Lobsterboats, Seals and Seabirds, and commentary on local history and happenings. Right around the corner, we have the island studded archipelago of the Muscle Ridge Islands, largely uninhabited, wild beautiful islands, our playground extends across Penobscot Bay for some of the finest sailing grounds in the world. Across the bay, we have the bevy of islands surrounding Vinalhaven, Northhaven, in the midst of the largest deepwater bay on the east coast of the US. Usually we sail in idyllic calm protected waters, exploring our part of Maine's deeply indented coast. Bay crossings can have more boistrous conditions at times briefly, but most of the time sailing Bufflehead here is like riding a magic picnic bench with silent wings amidst magnificent scenery. We are proud to have crafted this website using almost entirely our own pictures, to try to convey what we do, and help you find what to do. Most of the pictures, and much of the layout, artistry, and polish have been done by Quinton Donleavy, who excels at seeing what a small business does and helping convey it in this way. He maybe could help you too? All pictures (like the one below from Owls Head Lighthouse) are copyright him and me, Capt Daniel Bennett. I first made the site on Weebly in 2011, and appreciate their platform still. Any feedback on your experience here (or on the boat) is most welcome. ​We think it's pretty, and hope you do too! Thanks.